Cubs spring training baseball, mind you. I felt it too. Maybe it was the night game aspect, or maybe it was that MLB Network was broadcasting the game live. There was a palpable electricity in that park last night that stretched thousands of miles away to Chicago. Let us make no mistake about it: the electricity was provided via conduits Cubs Javy Baez and Mike Olt. Olt's blast in the 2nd inning got the buzz going early. It was quickly followed up by a wicked display of the near-legendary bat speed of Mr. Baez. This Baez 400 ft-plus blast nearly hit the left field scoreboard and provided the usual Twitter blow-up only like only he can. Thunder-snow has got nothing on Baez, who, along with Olt, now holds a tie for the team lead in homers this spring with three. Olt is becoming accustomed to this sort of thing. "It's not out of the ordinary from what I've seen," Olt said of Baez's shot in the 8-7 loss in 10 innings to the Mariners. "I've really never seen anything like him. He's definitely a special player. I'm used to it now. He's in my bp group everyday, so ... He's definitely fun to watch, and so are the other guys." Olt went deep again in the sixth and later provided an RBI single to cap off an impressive night. I've been hearing all along that the Cubs brass would love nothing more than for Olt to win the opening day third base job. All he needs to do is prove his shoulder can handle making the plays at third. He should get that chance, as he is slated to start playing the position soon. 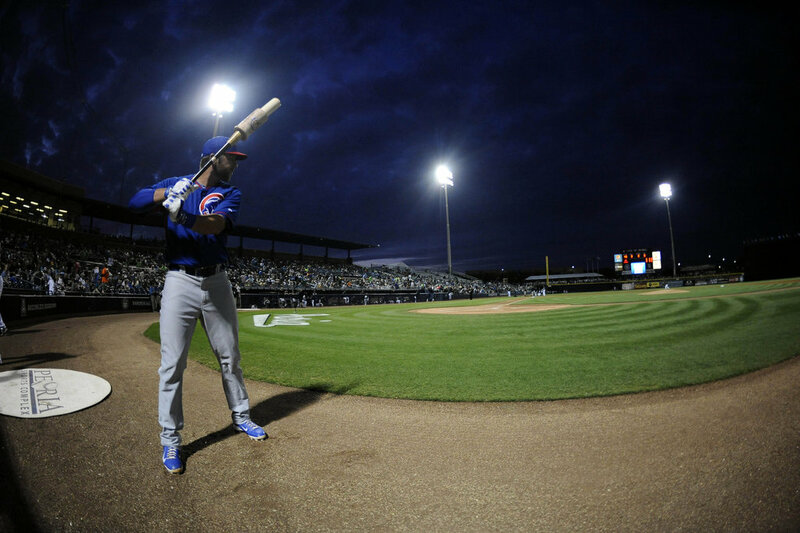 It was a day when top prospects Kris Bryant, Jorge Soler and Albert Almora were reassigned to minor league camp, reminding us that the Cubs' future isn't quite here yet. Even Baez understands it may not even be his time, as he told Paul Sullivan in this must-read piece. "Not really,'' he said. "Even though a lot of people say I was doing good last year, they were saying that because of the home runs. I can get better. I chased so many balls and I made a lot of errors. I realize I can do better. ", Says Baez. It could however, be Olt's time now. It also may not be long for the rest of the cavalry to arrive though, as they are quickly proving to have a mature mental aspect of their game down. "They have shown their ability to be professionals here," Rick Renteria said. "… They know there is a purpose and reason for everything that we do." We caught a major glimpse of that purpose last night. Last night did have that feel to it. I really want Olt to win the 3B job and for Baez to force his way up by June/July. From your mouth to Theo's ears. I agree. It be huge for Olt to make the major league squad and have a strong rookie year. It opens up so much trade flexibility with the surplus we have of 3B prospects and players in the infield. A few of our young guys will inevitably be traded in the next few years for pitching and quality veterans with large contracts that other teams want to dump. My guess is we'd take them provided the other team pays part of the contract. It's the flexibility we have with our payroll. The only question is when the FO feels we need that veteran presence. I'm guessing this off-season we'll see some moves, provided the progress of Baez, Bryant and Villaneuva puts pressure on opening up infield positions at the major league level. So I switched back to U-Verse a few months ago, but didn't realize until 10pm EST that I didn't have MLB Network as a part of my package. I got online to try to work something out, but alas, I was left with the audio only. But between that and Twitter, the vibe was still strong. There was definitely a palpable energy generated by those 3 blasts, and it spread quickly. Olt's got a good head of steam and I really hope he can carry that into the Bigs.